Toronto Public Health is collaborating with the Toronto Overdose Early Warning and Alert Partnership to provide timely information on overdose activity, with a current focus on opioids. Additional data and indicators may be added to this site as they become available. Toronto Paramedic Services is collaborating with Toronto Public Health to share information on calls for suspected opioid overdoses received by paramedics in Toronto. This includes the number and location of cases where the responding paramedic suspects an opioid overdose. This may differ from the patient’s final diagnosis in hospital or cause of death determined by the coroner. These findings are preliminary and subject to change. Please see the Data Notes tab for more information on these indicators. New Report: Detailed analysis from the first complete year of data on suspected opioid overdose calls to Toronto Paramedic Services (TPaS) is complete. Trends in Paramedic-Attended Opioid Overdoses: A Review of Suspected Opioid Overdoses in Toronto Paramedic Services Data, 2017/18 contains information on demographics of cases, trends by month, day, and time, and Toronto neighbourhood comparisons. Since August 7, 2017, Toronto Paramedic Service attended 64 non-fatal and three fatal suspected opioid overdoses per week on average. Fatal cases include those where the patient died on scene and the coroner was notified. Over this period, an average of 16 non-fatal cases per week had naloxone administered by a community member before paramedic arrival. Paramedics administered naloxone in an average of eight non-fatal cases per week. * Weeks are calculated Monday to Sunday and are labelled with the Monday of each week period. 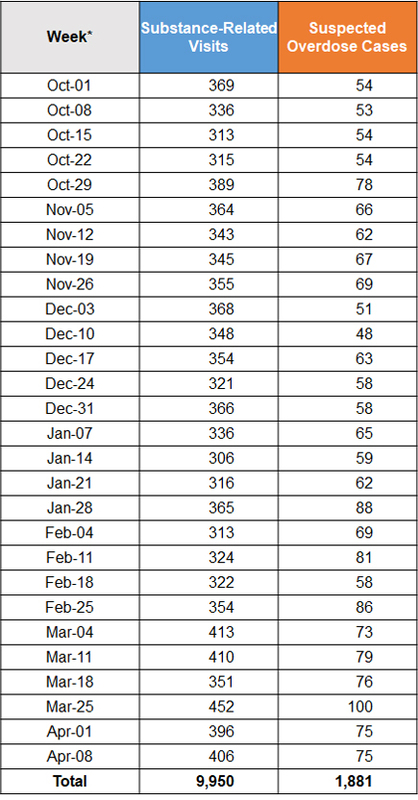 Table shows the most-recent three-month period. 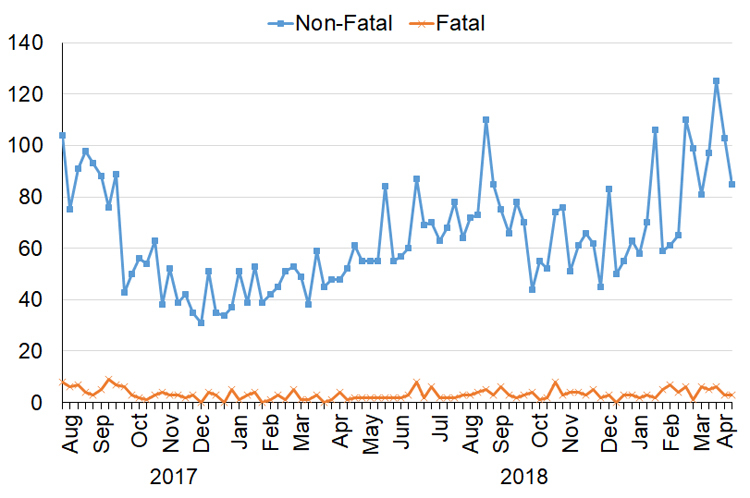 ** Due to ongoing review of case definition, some weekly numbers of suspected opioid overdose calls have changed slightly from what was posted prior to August 13, 2018.† August 2017 and April 2019 are not complete months’ worth of data. Data is captured for August 2017 starting on August 3, 2017, and for April 2019 up to and including April 14, 2019. Source: Toronto Paramedic Services. Electronic Patient Care Record. [Weekly: August 7, 2017 to April 14, 2019; Monthly: August 3, 2017 to April 14, 2019]. Extracted April 16, 2019. 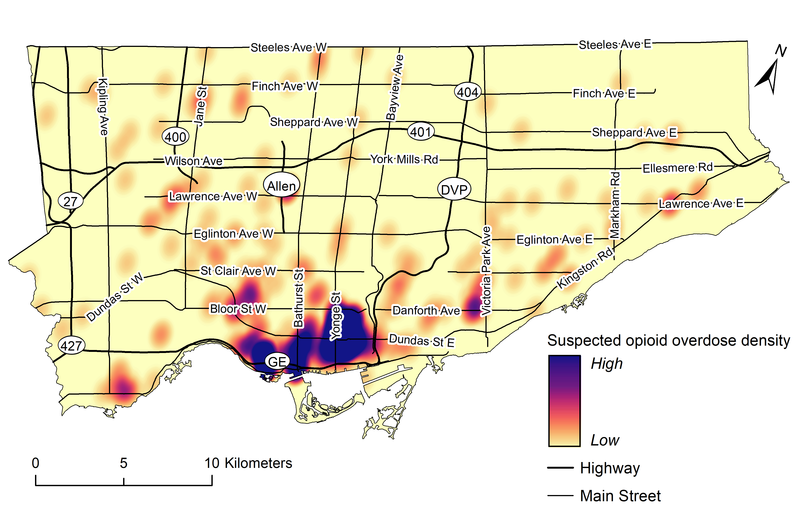 The map shows the distribution of opioid overdose calls received by Toronto Paramedic Services for March 2019. It includes fatal and non-fatal suspected opioid overdoses combined. The map shows the locations where paramedics made contact with patients. Please see the Data Notes tab for more information on these indicators. For more information on the number of calls by neighbourhood and nearest main intersection, please see Calls to Paramedics for Suspected Opioid Overdoses – Geographic Information. Substance-related emergency department visits at Toronto hospitals fluctuated between October 2018 and March 2019, with an increase in the last week of March. The number of suspected overdose cases followed a similar pattern, showing an increase at the end of March. Note that neither of these indicators are specific to opioids. Substance-related emergency department visits may be due to intoxication, addiction, overdose, or withdrawal. Suspected overdose cases are a subset of substance-related visits that specifically mention overdose in the chief complaint and meet a set of inclusion criteria. Please see the Data Notes tab for more information on these indicators. *The date noted indicates the start of the week. Counts are reported from Mondays to Sundays.Source: Acute Care Enhanced Surveillance System. ED Line Listings. October 1, 2018 to April 14, 2019. Extracted April 15, 2019. The number emergency department visits has fluctuated over the past two years with a peak seen in the summer of 2017. Following a sharp decrease in the fall of 2017, the number of emergency department visits has been steadily increasing. Hospitalizations for opioid poisoning remained relatively stable over the period. Note that changes to hospital reporting for opioid overdoses at the start of May 2017 may account for some of the peak increase seen in the summer of 2017. Please see the Data Notes tab for more information on this indicator. 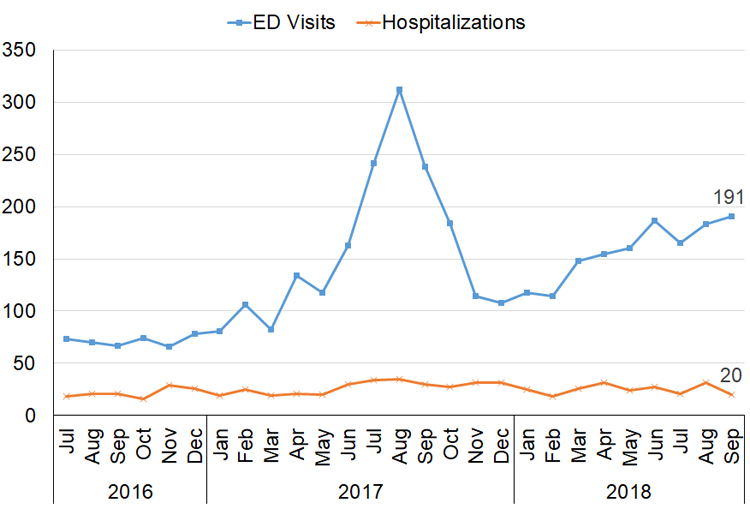 Source for ED visit data: National Ambulatory Care Reporting System, July 2016 to September 2018. Ontario Ministry of Health and Long-Term Care, IntelliHEALTH ONTARIO. 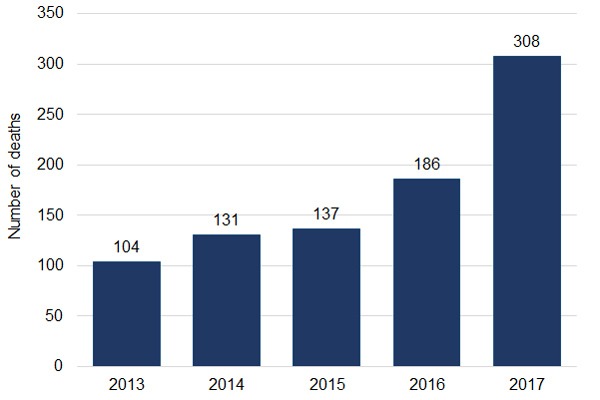 Extracted March 2019.Source for hospitalizations: Discharge Abstracts Database, July 2016 to September 2018. Ontario Ministry of Health and Long-Term Care, IntelliHEALTH ONTARIO. Extracted March 2019. In 2017, there were 308 opioid overdose deaths in Toronto. This includes accidental deaths, suicides, and deaths with undetermined intent. This represents a 66% increase in the number of people who died compared to 2016 and a 125% increase compared to 2015. In 2017, 1 in 4 opioid overdose deaths in Ontario occurred in Toronto. Preliminary data for 2018 indicate there were 193* opioid toxicity deaths in Toronto in the first nine months. This number is expected to increase as the cause of death is confirmed for more cases. Please see the Data Notes tab for more information on this indicator. New data: In May 2017, the Office of the Chief Coroner for Ontario (OCC) began using a new tool to collect information on deaths caused by opioid overdoses in the province of Ontario. Coroners now use the ‘Opioid Investigative Aid’ to gather detailed information about people whose deaths were caused by opioids. Analyses of preliminary data from October 1, 2017 to September 30, 2018 are summarized below the following graph. Source: Public Health Ontario. Interactive Opioid Tool. 2013 to 2017. Accessed on October 23, 2018. The numbers reported below are preliminary and subject to change. Only cases that are confirmed by the OCC as opioid toxicity deaths are reported here. As coroners’ investigations proceed, it is expected that new cases for this time period will be identified, so these numbers may rise in the coming months. These data represent confirmed opioid toxicity deaths from October 1, 2017 to September 30, 2018. Please refer to the total number of deaths in 2017 in the figure above for the most recent full calendar year’s number (308 deaths). There were 257* confirmed opioid toxicity deaths among residents of Toronto between October 1, 2017 and September 30, 2018. During this one-year period, the majority of deaths in Toronto (94%) were accidental, compared to 89% in the rest of Ontario. Five percent (5%) of deaths in Toronto were classified as suicide, compared to 9% of deaths in the rest of the province. 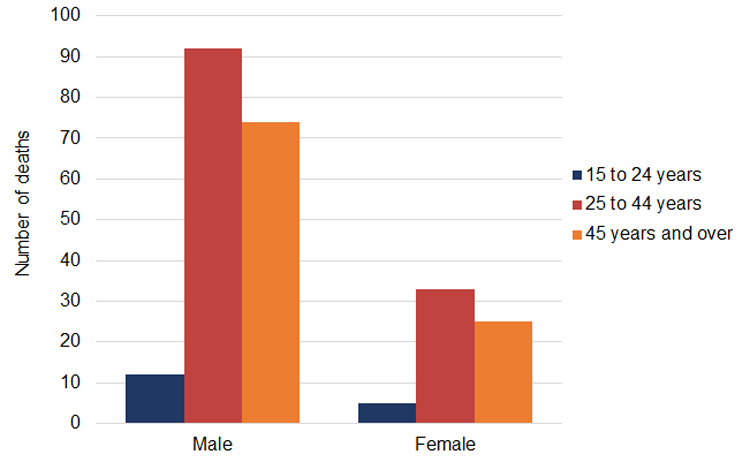 Seventy-four (74%) percent of accidental opioid toxicity deaths in Toronto from October 1, 2017 to September 30, 2018 were male. Fifty-two percent (52%) occurred among individuals aged 25 to 44 years. For the majority (75%) of accidental opioid toxicity deaths in Toronto between October 1, 2017 and September 30, 2018, the overdose occurred in a private residence. This trend was similar in the rest of Ontario. Naloxone use was reported in 22% of accidental opioid toxicity deaths; however, there was missing information in 10% of cases.† In 31% of cases where naloxone use was reported, it was administered by bystanders. In 48% of cases, it was used by hospital workers, and in 52% it was by emergency responders. Fentanyl was the most commonly reported opioid contributing to death. Fentanyl and its analogues were more common contributors to accidental death in Toronto (78%) compared to the rest of Ontario (69%). 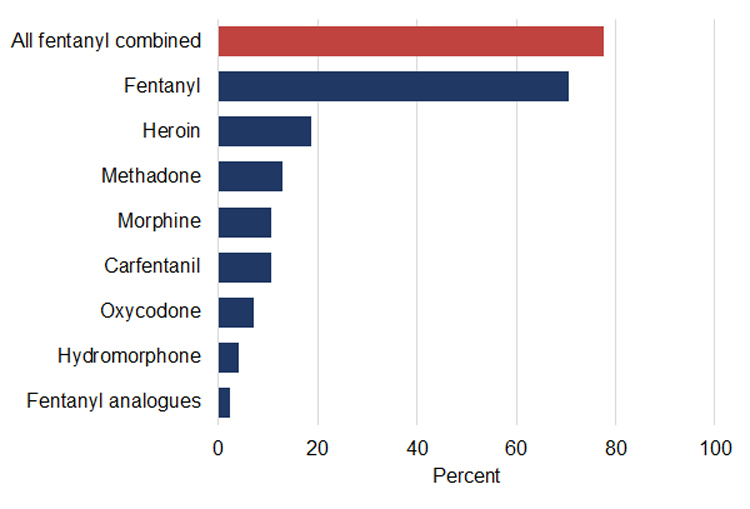 * Numbers are preliminary and subject to change.† Individuals with missing and unknown data are included in the denominator for this analysis.‡ Drug categories are not mutually exclusive; some deaths are attributed to multi-drug toxicity where a death can include more than one opioid as a cause.§ The “All fentanyl combined” category includes fentanyl, carfentanil and fentanyl analogues. 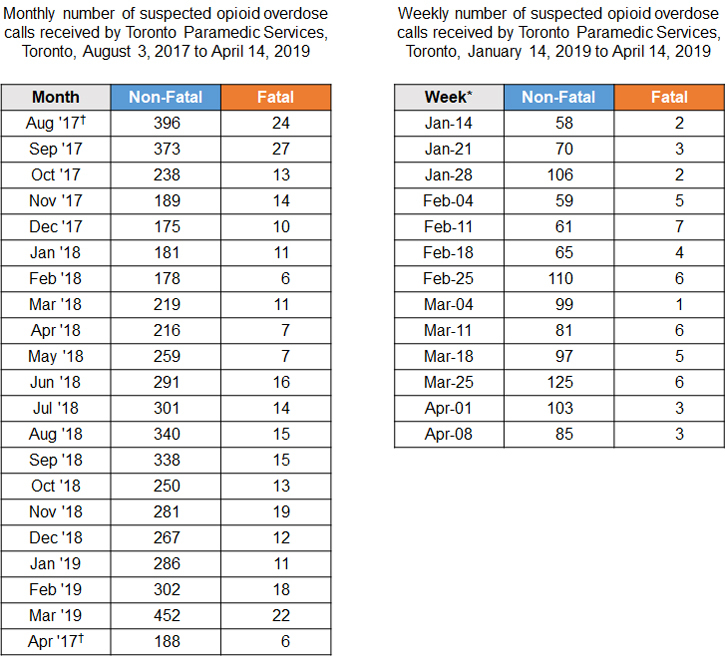 Data source: Coroner’s Opioid Investigative Aid, October 1, 2017 to September 30, 2018, Office of the Chief Coroner for Ontario, extracted January 21, 2019. On August 21, 2017, Toronto Public Health opened the interim site for supervised injection services at The Works. Services moved to the permanent site on October 30, 2017. Supervised injection services are health services that provide a hygienic environment for people to inject pre-obtained drugs under the supervision of a trained health care professional. In addition to supervised injection, individuals are provided with sterile injection supplies, education on safer injection, overdose prevention and intervention, medical and counselling services, and referrals to drug treatment, housing, income support and other services. Please see the Data Notes tab for more information on these indicators. 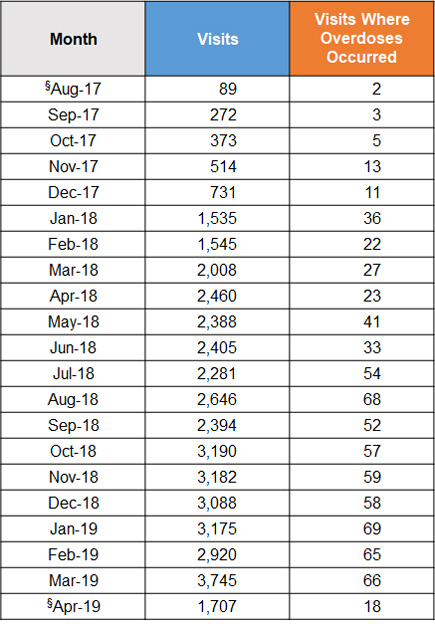 As of April 14, 2019, there were 42,648 visits to the supervised injection service. There were 782 visits where an overdose occurred, including 301 visits where the client required naloxone. Monthly number of visits to the supervised injection visits, The Works, August 21, 2017 to April 14, 2019§. * Before October 14, 2018, weeks were calculated Monday to Saturday. As of October 14, 2018, the supervised injection service is also open on Sundays, weeks are now calculated Monday to Sunday and are labeled with the Monday of each week period.† Due to an ongoing review, data currently presented are preliminary and subject to change.‡ Some weeks include reduced hours due to holiday schedules.§ August 2017 and April 2019 are not complete months’ worth of data. Data are captured for August of 2017 starting on August 21, 2017 and April 2019 up to and including April 14, 2019. Sources: NEO database & The Works – Toronto Public Health. Extracted April 15, 2019. Indicators of opioid prescribing in Ontario can be accessed from the interactive Prescription Opioid Tool. This tool uses data from the Narcotics Monitoring System to provide information on opioid prescriptions from retail pharmacies in Ontario. The weekly number of new admissions to Toronto-based treatment centres fluctuated over the past year with no clear pattern emerging. Please see the Data Notes tab for more information on this indicator. Source: Centre for Addiction and Mental Health. Drug and Alcohol Treatment Information System. March 5, 2018 to March 3, 2019. Extracted April 1, 2019. Public Health Ontario recently released an interactive tool that explores trends in opioid-related emergency department visits, hospitalizations and deaths from 2003 to 2015 in Ontario. Toronto Public Health has created a summary document that reviews the key findings for Toronto. Please note that the interactive tool and summary document capture outcomes occurring among Toronto residents only and as such, will include fewer occurrences than those included on this website (which capture all overdose outcomes occurring in Toronto, regardless of where an individual resides). Toronto Public Health worked with community partners to develop the Toronto Overdose Action Plan: Prevention & Response, which was endorsed by the Board of Health on March 20, 2017. The Plan includes a comprehensive set of actions for all orders of government to prevent and respond to drug overdoses. The Province of Ontario has launched a new website with information on where to get free naloxone kits in your area. Source: Toronto Paramedic Services. Paramedic Electronic Patient Care Record. This indicator is preliminary and subject to change pending further review of the data source. This indicator includes cases where the responding paramedic suspects an opioid overdose. This may differ from the final diagnosis in hospital or cause of death determined by the coroner. Fatal cases includes those where the patient died on scene and the coroner was notified. Patients who die after being transported to hospital may be miscategorized here as ‘non-fatal’ cases. This indicator includes only instances where 911 is called and underestimates the true number of overdoses in the community. The map shows the locations where paramedics made contact with patients, which may or may not be the same location from which 911 was called. The colours of the heat map indicate the relative density, defined as the number of cases per unit area. As a stretch legend is used to visualize the density, this map should not be interpreted in absolute terms when compared to heat maps from other time periods. Suspected opioid overdoses occurring slightly outside the City of Toronto boundaries were excluded from the map. Source: Acute Care Enhanced Surveillance System. ED Line Listings. This data source only captures substance-related visits that result in an individual seeking care in a hospital setting. This is likely an underestimation of the true burden of overdose in the population. ACES is a syndromic surveillance system that classifies visits and admissions into ‘syndromes’ using algorithms to assess and classify open text from the chief compliant recorded at triage or registration. This process allows ACES to provide daily counts of visits and admissions. This data source captures visits to acute care facilities in Toronto. However, it does not currently capture visits to specialty hospitals, such as the Women’s College Hospital. Visits to the Centre for Addiction and Mental Health are included in ACES as of November 23, 2017. ‘Substance-related visits’ include instances of intoxication, addiction, overdose, or withdrawal. ‘Substance-related visits’ include those caused by opioids or non-opioid related drugs (OPI and TOX syndromes, combined). It excludes those related to alcohol. This indicator includes all visits to Toronto hospitals, regardless of whether or not the individual resides in Toronto. Monday to Sunday week units are used here as the unit of analysis, with the starting date of each week labeled on the x-axis of the graph. This indicator is only available from May 2017 onwards, due to availability of data. This data source only captures suspected overdoses that result in an individual seeking care in a hospital setting. This is likely an underestimation of the true burden of overdose in the population. ACES is a syndromic surveillance system that classifies visits and admissions into ‘syndromes’ using algorithms to assess and classify open text from the chief compliant recorded at triage or registration. This process allows ACES to provide daily counts of visits. ‘Suspected overdoses’ refer to a subset of substance-related visits that specifically reference ‘overdose’ in the chief complaint. It excludes overdoses that specify a substance of non-interest (e.g. alcohol, over-the-counter medication, prescription drugs of non-interest such as blood pressure medication, and toxic products such as cleaning products). ‘Suspected overdoses’ include only visits with a Canadian Triage Acuity Score of 1 (Resuscitation), 2 (Emergency), or missing. ‘Suspected overdoses’ excludes visits to children less than 10 years of age. For the majority of visits, the substance causing overdoses is not specified. It is important to note that this indicator measures overdoses from all types of substances, not just opioids. ‘Suspected overdoses’ also excludes intentional overdoses or those related to self-harm. This data sources captures visits to acute care facilities in Toronto. However, it does not currently capture visits to specialty hospitals, such as the Women’s College Hospital. Visits to the Centre for Addiction and Mental Health are included in ACES as of November 23, 2017. Source: National Ambulatory Care Reporting System. Ontario Ministry of Health and Long-Term Care, IntelliHEALTH ONTARIO. 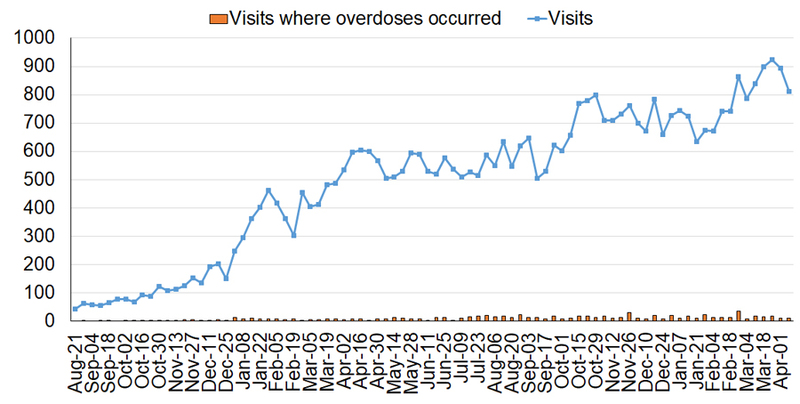 This data source also only captures overdoses where patients visited the emergency department. It is likely these data underrepresents the true burden of overdose in the population. This data source includes all visits to Toronto hospitals, including those who are residents of other municipalities accessing care in Toronto. Opioid poisonings were measured using ICD-10 codes: T40.0 – Opium, T40.1 – Heroin, T40.2 – Other opioids (e.g. Codeine, Morphine), T40.3 – Methadone, T40.4 – Other synthetic narcotics (Pethidine) and T40.6 – Poisoning by other and unspecified narcotics. This indicator include visits where opioid poisoning was listed as a main or a contributing cause. Emergency department visits includes only unscheduled visits. Source: Discharge Abstracts Database. Ontario Ministry of Health and Long-Term Care, IntelliHEALTH ONTARIO. 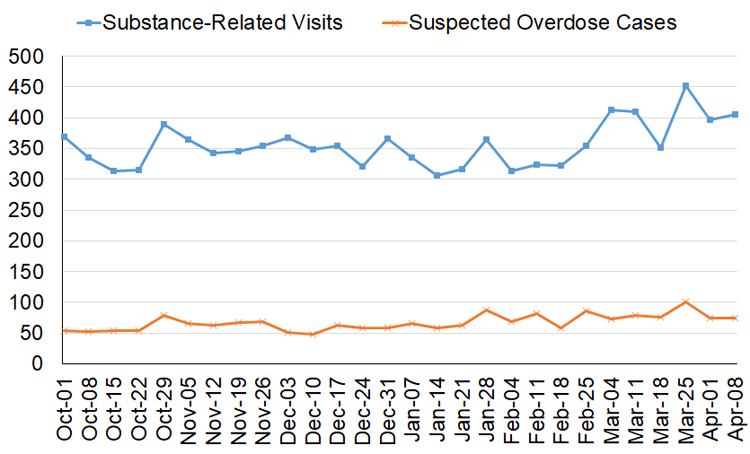 This data source also only captures overdoses where patients were hospitalized. It is likely these data underrepresents the true burden of overdose in the population. This data source includes all hospitalizations to Toronto hospitals, including those who are residents of other municipalities accessing care in Toronto. This indicator includes hospitalizations where opioid poisoning was listed as a main or a contributing cause. In the May 2017 update of this indicator, the data source was changed from the National Ambulatory Care Reporting System to the Discharge Abstracts Database to be consistent with how Public Health Ontario is measuring this indicator. The Discharge Abstracts Database also contains more detailed information about hospitalizations, as records include all information available at the time of discharge which is often more specific than information available at admission. 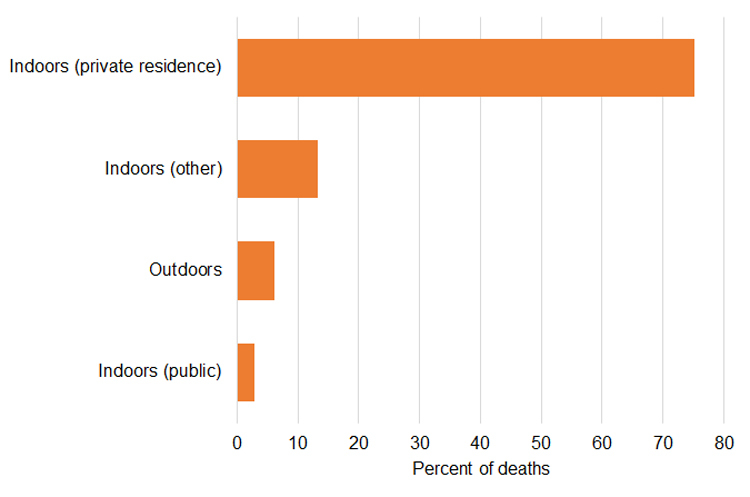 These data include all manners of death from opioid toxicity (i.e. accidental and intentional) combined. The deaths included here are caused by opioid toxicity, with or without other drugs also contributing to death. Deaths due to chronic substance use, medical assistance in dying, homicides and trauma where an intoxicant contributed to the circumstances of the injury are excluded. Source: Coroner’s Opioid Investigative Aid, October 1, 2017 to September 30, 2018, Office of the Chief Coroner for Ontario (OCC), extracted January 21, 2019. These data only include confirmed opioid-related deaths for which an investigation has identified an opioid as directly contributing to the cause of death. The numbers reported are preliminary and subject to change. As coroners’ investigations proceed, it is expected that new cases for this time period will be identified. The OCC implemented the Opioid Investigative Aid in May of 2017. The detailed information resulting from this tool are not available prior to this date. Deaths have been assigned to Toronto based on the six-digit postal code of the residence of the deceased. If the postal code of the residence was not available, the postal code of the incident location was used. If this information was not available, the postal code of the death location was used. Gender is based on gender identity at time of death. Ethnicities include White, Indigenous (First Nations, Métis, Inuit), Black, Latin American, South Asian (East Indian, Pakistani, Sri Lankan), all other ethnic groups combined (Chinese, Filipino, Arab, Southeast Asian (Vietnamese, Cambodian, Malaysian), West Asian (Iranian, Afghan), Korean, Japanese, Other), and unknown; groupings were based on frequency of occurrence in the data as of the report creation date. Indoors (private residence) – apartments, condominium, row house/townhouse, rural/agricultural: residential, trailer/mobile home, single-detached house, semi-detached house. In Toronto, this includes community housing. 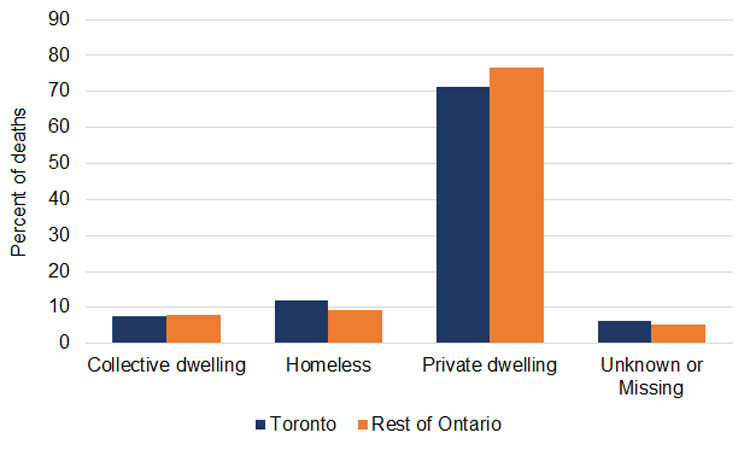 Source: The Works – Toronto Public Health. Supervised Injection Services. Numbers are preliminary and subject to change. Number of visits refers to the number of clients visiting the supervised injection services (SIS). This includes all visits to the SIS, regardless of whether the client injected. Visits may be from repeat clients. Number of overdoses refers to the number of visits resulting in an overdose event that occurs within the site or that occurs to a client who has injected at the site, as reported by the manager at The Works. This does not refer to unique clients. Number of naloxone administrations refers to the number of visits resulting in a naloxone administration. Note that multiple doses of naloxone may be administered during one overdose event. Source: Drug and Alcohol Treatment Information System. Centre for Addiction and Mental Health. This indicator captures new admissions to treatment centres in Toronto only. Individuals who access addiction treatment services through primary care, hospitals, private clinics and federally-funded First Nations health service providers are not included in this indicator. Presenting problem substances are self-reported by clients. Individuals can list up to 5 substances upon admission. Individuals who specify multiple presenting problem substances are counted as a new admission for each type of substance. For instance, if an individuals specifies heroin and prescription opioids as presenting problem substances, they will be counted as a new admission for both heroin and prescription opioids. Completeness of this indicator is limited by timeliness of what is submitted by health service providers. This can vary from provider to provider. Counts for recent weeks may be subject to change, as more service providers complete their reporting.